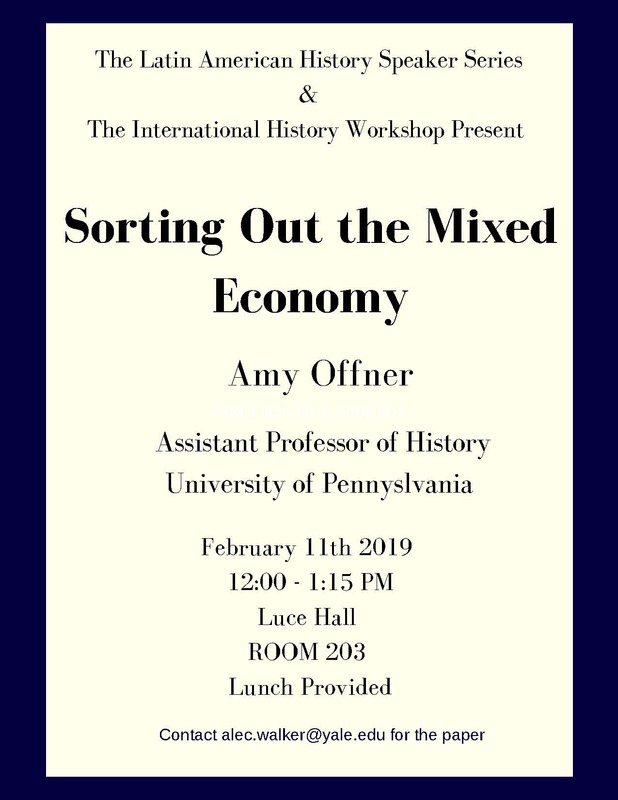 “Sorting Out the Mixed Economy,” a talk by historian Amy Offner. Amy C. Offner studies twentieth-century US history in global perspective, with special focus on Latin America. Her research and teaching address the history of capitalism and political economy, empire and foreign relations, and social and intellectual history. She is writing a book, tentatively entitled Sorting Out the Mixed Economy, that reinterprets two problems in postwar political economy: the making and unmaking of welfare and developmentalist states, and the rise of economic reasoning in public life. Because both phenomena unfolded simultaneously across world regions, the study is transnational, tracing circulations of ideas and practices within the Americas that ultimately remade two important countries in the hemisphere: the United States and Colombia. The project is both a transnational history of social policy and a social history of economic thought. It suggests that one way of understanding the route from the New Deal to the Great Society is by traveling through Latin America in the era of the Alliance for Progress. It simultaneously shows how neoliberalism grew out of midcentury ideals and practices, rather than in simple opposition to them. And it demonstrates the Third World roots of disciplinary formation in the North Atlantic. Offner’s second project turns from public policy and economic thought to business, labor, and legal history. It offers an international and historical perspective on a major shift in late twentieth-century capitalism: the expansion of capital accumulation strategies that did not involve directly owning or managing productive facilities. In the global north, manufacturers in the postwar years famously created long chains of subcontractors that shielded them from legal claims by workers and communities engaged in production. In the global south, workers in industrial sectors also saw multinational corporations retreat from their roles as direct employers and managers, not only through the expansion of subcontracting but through joint ventures and portfolio investment. This project explores the midcentury Third World as a proving ground where multinational mining and industrial firms devised ways to pursue profits without bearing the risks and responsibilities traditionally associated with ownership and management. It traces experiments in the early postwar decades, and explores their global spread and consequences. Offner has been a postdoctoral fellow at the Center for the United States and the Cold War within NYU’s Tamiment Library, and has received fellowships and grants from institutions including the American Council of Learned Societies, the Social Science Research Council, the Charles Warren Center at Harvard University, the Inter-American Foundation, the Society for Historians of American Foreign Relations, and the Duke University Center for the History of Political Economy. Before beginning graduate studies, she worked as a union organizer and an editor at Dollars & Sense, a magazine and book publisher analyzing economic affairs. In 2008, she worked for the Landmine Survivor Network in Bogotá, Colombia.